Despite Setbacks, Migrants in Tijuana Still Hope for Entry into U.S. Among the migrants are mothers and children, teenagers traveling alone, and groups of friends hoping to find work in the U.S.
Luis Conde sits on a curb near the Benito Juarez Sports Complex in Tijuana, Mexico. He laughs with his friend, smiling, a bag of fruit next to him. 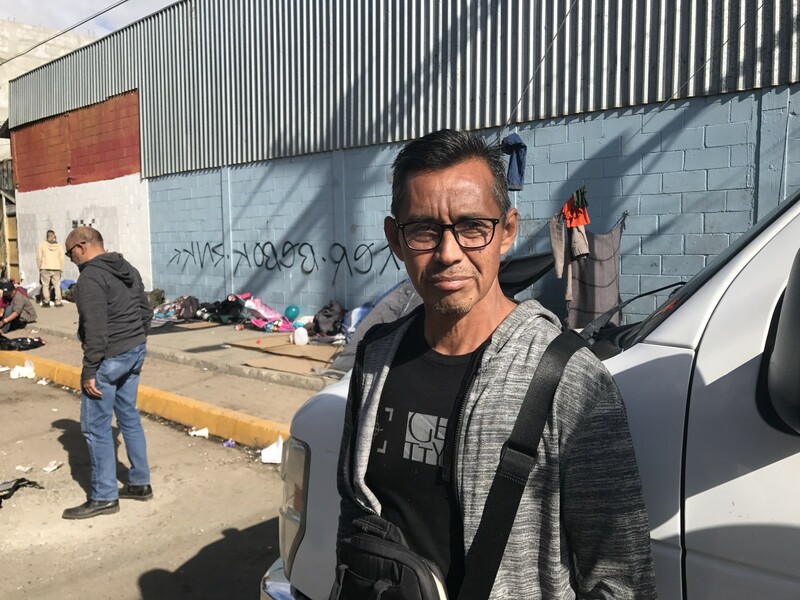 Conde, 46, hails from Guatemala and is one of thousands of migrants who have traveled from Central America aiming to cross the border into the United States. 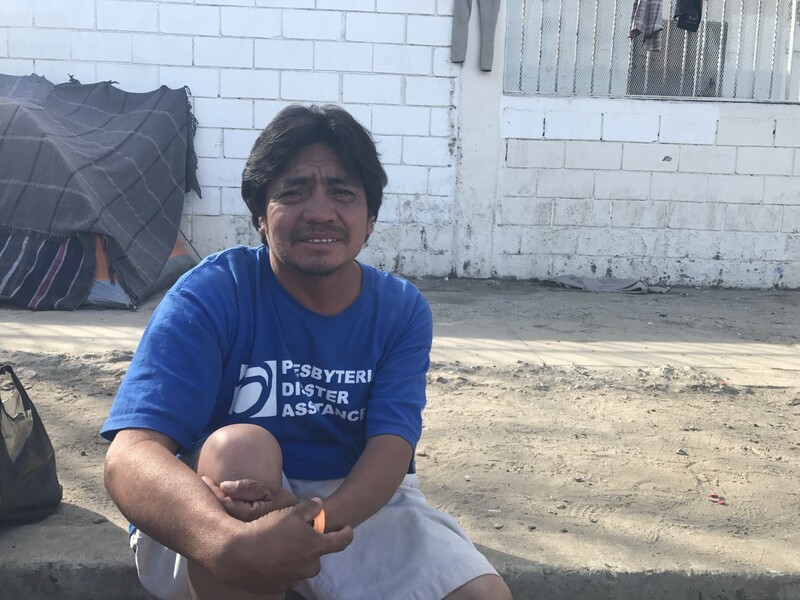 He arrived in Tijuana 15 days ago, he said Wednesday, and spends his days walking around getting to know the town. Most migrants were held at the Benito Juarez Sports Complex in Tijuana. On Friday, the city of Tijuana opened another center for the group. There are currently over 6,000 migrants staying in Tijuana. The migrants come from across Central America — fleeing crime, violence and a lack of work in their home countries. Many migrants are seeking asylum in the U.S., while others wish only to work. On Sunday, U.S. Customs and Border Patrol agents fired tear gas on around 500 migrants approaching the border requesting that the U.S. speed up the process for the asylum seekers. Some members of the group rushed the border at the San Ysidro crossing, prompting U.S. officials to respond with tear gas. Now the migrants wait, the next steps unknown. Conde said he does not plan to cross the border anytime soon, referencing the violence that unfolded Sunday and President Donald Trump’s rhetoric toward the migrant group. “Trump doesn’t want to give a chance to nobody,” Conde said in English. He plans to work in Tijuana for a while before eventually making his way to the U.S.
Luis Conde struggled to pay rent and feed his family in Guatemala, prompting him to make the journey to the border with the group of migrants. Trump remains determined to build a wall on the southern U.S. border and has made it clear he will shut down the government if Congress refuses to approve funding for the project by next week’s budget deadline. The U.S. closed the border at the San Ysidro crossing near San Diego on Sunday for five hours, Times of San Diego reported, and the President continues to threaten further closures. The U.S will also extend the military deployment at the border for an additional 45 days, U.S. officials said Friday. Despite efforts to preserve their camp Wednesday afternoon, a storm overtook Tijuana by the evening and flooded many of the migrants’ shelters at the sports complex, makeshift homes of tents and blankets for entire families. On Thursday morning, a hunger strike broke out among migrants after Mexican officials stopped a group from approaching the border crossing at El Chaparral. The group again demanded that the U.S. speed up the asylum process. Under the current system, more than 5,000 people are on a waitlist to apply for asylum. This includes migrants from the caravan as well as migrants that arrived in Tijuana separately. 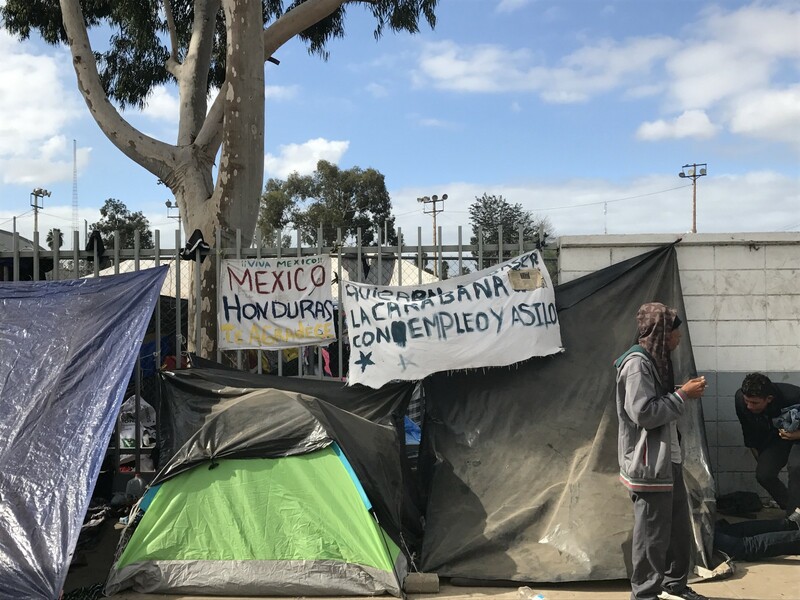 The City of Tijuana began moving migrants to another center early Friday after the storm and due to other concerns over unsanitary living conditions. While migrants can stay at the Benito Juarez complex, city officials will no longer be offering food at the location. Marlena Gonzalez, 36, is a mother of two from El Salvador. She and her family are seeking asylum, but she said it will be more difficult for them and other asylum seekers since the violence erupted at the border Sunday. 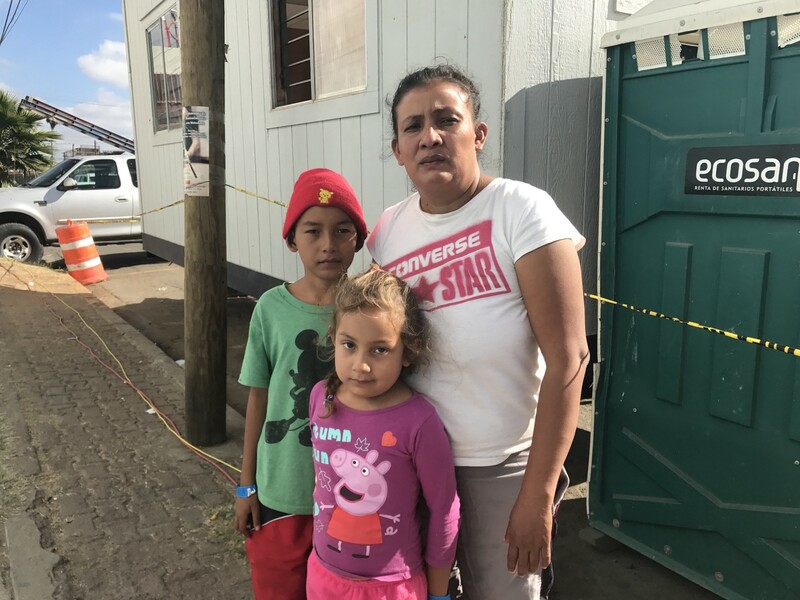 Marlena Gonzalez, her husband, and their two children traveled from El Salvador seeking asylum in the U.S.
Guadalupe Galindo, 28, who traveled with her nine-year-old son from Honduras, echoed this sentiment. She called Sunday’s events “a disaster” and expressed anger with the migrants who approached the border. Galindo, Gonzalez and Conde are uncertain about their futures, but they know one thing for sure right now: They cannot go back. “We’re living in danger all the time [in Guatemala],” Conde recalled of his home country. The International Organization for Migration (IOM) is helping some migrants return to Central America. According to an IOM press release, as of Wednesday, 453 migrants requested the organization’s support to return to their countries of origin: El Salvador, Guatemala and Honduras. Conde lived in the U.S. for 30 years before returning to Guatemala. He said he struggled to pay rent and provide food for his family, recalling that there wasn’t enough money to meet both basic needs.The access to water was also limited, he added. When the Guatemalan government began imposing new taxes, Conde said it became even more challenging. After his family was threatened by gang violence, Conde left Guatemala in hopes of finding work in the U.S.
“Find a job … work any job,” Conde said, listing his skills: construction, fishing, working in a restaurant. “Anything,” he lamented. Conde is also diabetic and said it’s hard to come by much medication at the migrant camp. Health units offering services to migrants were set up at the sports complex, but the unsanitary living conditions could not be ignored. Portable toilets lined the outside of the complex, and the smell of sewage was undeniable. Additional support has come from the Mexican Navy bringing food to migrants, volunteers and church groups donating supplies, and organizations like the Mexican Red Cross and National Commission of Human Rights. However, with approximately 6,000 migrants in one city, the demand outweighs the supply. Ernesto Campos worried about the migrant children not receiving enough food or shelter. He asks that the U.S. and Mexican governments work together to confront the international crisis. Ernesto Campos is a Tijuana resident who came to see the migrant camp on Wednesday. He watched the children scamper around or sit on the side of the street, alone or with a parent. Campos is deeply worried about the migrant children. “They are hungry,” he said, pointing to the adult men that quickly lined up for food while the children waited on the side. The children need more food and shelter, he said. He suggested that volunteer organizations bring leftover school lunches to the migrants. He also asked more of the U.S. and Mexican governments, encouraging them to work together to confront this problem. The Tijuana government has also called for more support from international organizations and the Mexican federal government. “Less news, more action,” Campos said urgently. With minimal asylum applications processed each day, expanding U.S. border security, and the changing weather threatening migrants’ shelters and health, many migrants seem to have the same answer: They wait, and they hope. San Diego-based reporter. Coffee + travel enthusiast.